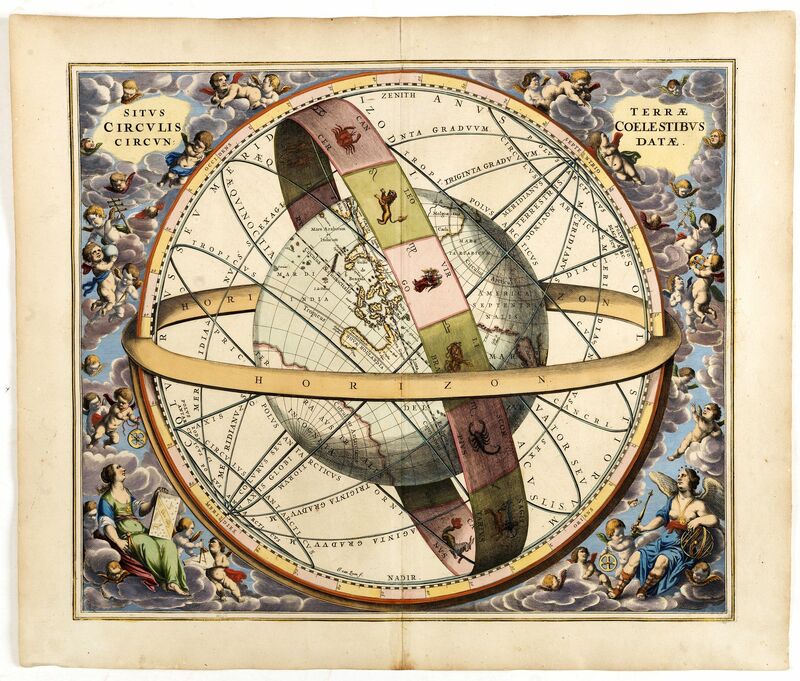 Paulus Swaen, Celestial chart - ctalogue pour le salon Paris map fair globes & instruments scientifiques. Situs Terrae Circulis Coelestibus circundatae. .
CELLARIUS, A. - Situs Terrae Circulis Coelestibus circundatae. . . Size: 16.4 x 20.2 inches. In good condition, dark impression. Some very minor marginal spotting. A celestial chart showing a large globe centered on Australia and the Pacific, with California as an island, South East Asia, encircled by the zopdiacal band according to Ptolemy. In corners decorative scrollwork and cherubs. From the rare first edition, without pate number in lower right corner. Andreas Cellarius (active from 1656-1702), Dutch mathematician and geographer, rector of the Latin School at Hoorn. He may have been of German or Polish origin, with the name of Keller or Kellner. Cellarius adopted the system of Julius Schiller who renamed all constellations known at that time and sketched them again in order to fit the sky into a system of Christian symbolism. In Cellarius' Atlas Coelestis Schiller's system has been elaborated further. In fact, Schiller became more widely known by Cellarius' atlas than by his own work. From: Atlas Coelestis seu Harmonia Macrocosmica.